There is no natural or habitual bite as a reference when all of the teeth have been lost. 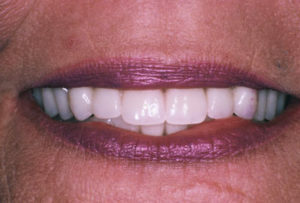 Traditionally, dentures have been fabricated to an arbitrary jaw position that is often “over closed”. This is a condition where the lower jaw is positioned too close to the upper jaw and causes the dentures to be fitted with prosthetic teeth that are too short. The resulting jaw position not only has a negative effect on the appearance of the denture wearer, but also can lead to significant functional problems and pain. We treat the denture patient by first determining the jaw position at which the muscles of the head and neck are most relaxed. Denture patients treated to this position generally have much improved appearance and function.